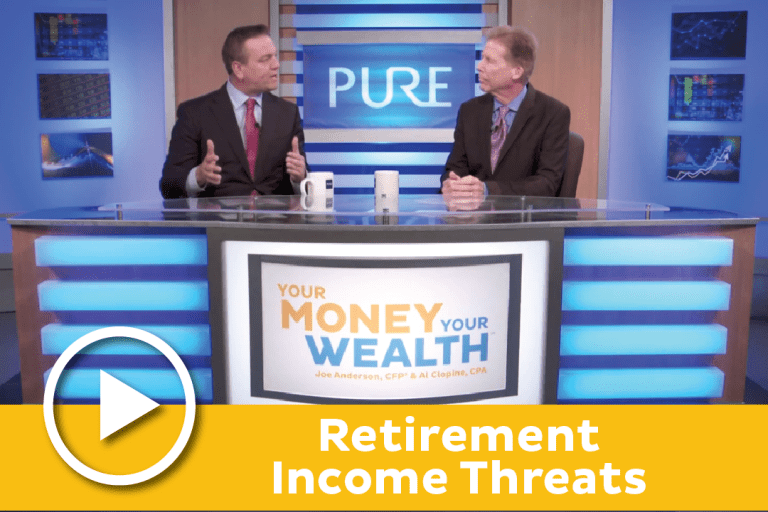 Retirement Income: Steps to Financial Freedom | Pure Financial Advisors, Inc.
For most people, the scariest thing about retiring is whether or not they’ll have enough money to continue to live comfortably. You have lived most of your life receiving an income, but now you have to prepare for what the future holds without a steady paycheck. Whether you’re already in retirement or preparing for it, there are a few things you should know to help make sure your retirement income is safe and secure. 4. Can Your Retirement Income be Garnished? 5. Which States Tax Retirement Income? Planning for income in retirement isn’t easy, but it is well worth the effort. Here are a few tips to ensure your retirement income plan is on track. It’s hard to aim accurately without a target. To establish and hit your goals for income in retirement, you’ll first need to know what they are. Many people start with a general notion of maintaining their current lifestyle, but what does that mean economically? Is this 80% of what you’re making today since some expenses like your mortgage or assistance to children will no longer be present? Alternatively, perhaps 100% or more since now every day of the week is Saturday? These are tough questions that can vary depending on your specific situation so try and determine what a realistic goal is based on your preferences and circumstances. One of the first things you may want to do is save a little bit of money on taxes by trying to maximize as much as you possibly can into those retirement accounts, 401K plans, SEP IRAs, SIMPLE IRAs, 403Bs, 457s, etc. This is a really good starting point for a lot of people to start saving. You can really maximize some of these plans here depending on what type of plan that you want to set up. Depending on your goals, you’re going to want to find out what plan is appropriate. Let’s say you’re approaching retirement age, but you have no retirement savings, no 401(k), no stocks, no investments, and no real estate. What do you do now? What is your next step when planning for retirement? Unfortunately, this is not an uncommon situation. There are a couple of things you can do. First, you have to take a really hard look at your budget and potentially cut some things out to make your goals. Next, if you have a car, consider selling it and buying something cheaper. It would help if you built up any liquid assets you can build up. You might need to look into moving to someplace less expensive. Look at your Social Security statement and figure out exactly what that benefit is going to pay you at 68 or 70. Try living off that amount for the next few years while you still have an income coming in and try working as long as you possibly can. Start rehearsing your lifestyle with the amount of income that is going to come in, right now, and then save everything else and your retirement is going to at least be a little bit more palatable. To succeed in planning for retirement, you’ll need to be on the same page with your spouse or significant other with whom finances are comingled. Start these discussions long before retirement and revisit the conversation as progress toward retirement occurs. Understand how your retirement plan at your employer, or the plan type you have as a self-employed individual, works. Are you taking advantage of the full available match? Are the investments appropriate for your goals? Do you have a strategy to rebalance as changes occur in the account? 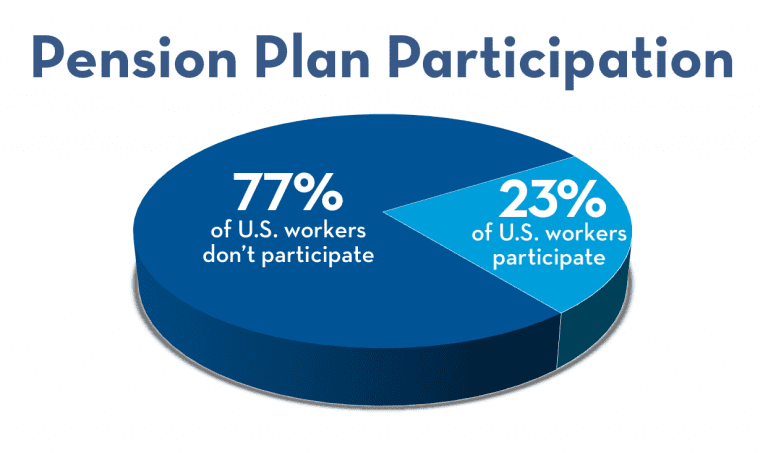 Pension Rights Center found that only 23% of all U.S. workers participate in a pension plan. So, what does that mean? That means 77% of workers will have to create their own retirement income. So, you need to figure out how to create a retirement income from all of your sources. How do you incorporate social security with your savings? 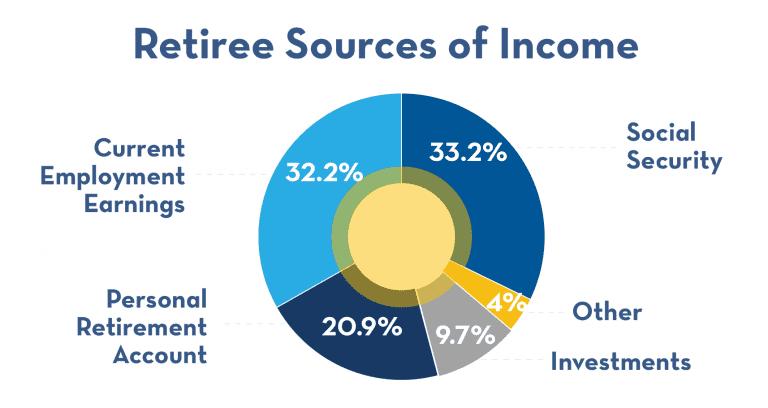 What type of investments should you choose to create that steady stream of income? Now, if you are one of the lucky people who have a pension plan, you need to find out what your options are for income at retirement. What formula is used to calculate the benefit for yourself as well as a surviving spouse? Get to know your plan in detail, potentially attending any annual information session your organization has or meeting directly with your benefits representative. Deciding on a Social Security strategy can be daunting. You’ll need to determine when to take your benefits and understand if spousal benefits will be a part of your filing strategy. Those who will have non-covered pensions will wish to research the implications of the Windfall Elimination Provision (WEP) and Government Pension Offset (GPO) to see if these will affect their received benefits they can claim based on their own earnings record or the record of a spouse. To start the planning process, visit the Social Security website and create an account to view your benefit estimate and earnings history. Those potentially affected by WEP or GPO will not see these offsets in their benefit estimate. The Social Security Administration will ask about other income sources when you file for your benefit, so it’s to your advantage to research the implications of these provisions beforehand, either with your own financial professional or using the applicable calculators. We all understand the benefits of diversification of investments. We can reduce our risk by holding a variety of investments rather than just the stock of our employer, for example. A similar advantage can occur through tax diversification. Too many retirees have only tax-deferred money, such as their balances in traditional IRAs or 401ks. This means they received a deduction on the way in when they made their contribution to the plan but will now pay taxes not only on their contribution but any growth the account has earned as well, as balances are withdrawn. 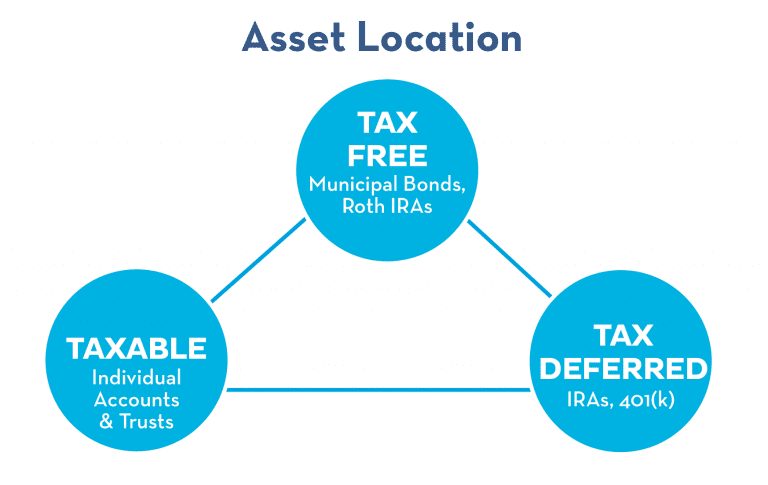 While tax-deferred accounts certainly have a place in retirement planning, they are only one of the three possible “pools” of money available to investors. Tax diversification can be achieved by having funds not only in the “tax-deferred pool,” but also in tax-free accounts such as a Roth IRA or regular taxable non-retirement (aka “non-qualified”) accounts. Once withdrawing from these sources in retirement, investors can enjoy increased flexibility depending on their income situation in a given year as well as current tax rates. The market goes up, and then it goes down. However, once you retire, the game changes entirely on you. What the market does in the first several years of your overall retirement can have a significant impact if you don’t have a withdrawal strategy. You have investor A and investor B and 30 years of retirement. Let’s say they each averaged a 6% rate of return, but investor A had positive returns for the first several years of retirement, while investor B had negative returns their first several years of retirement. Even though over 30 years they each averaged 6%, the person that had negative returns at the beginning of their retirement will most likely have a different retirement experience – and not in a good way. This is a big concern because markets are at all-time highs and for people retiring right now. Markets go down, so you need to be aware of the downside risk of what you’re doing in your overall portfolio because the sequence of returns risk could hurt your retirement planning. You need to ask yourself, how much stock and bonds should you have? What does that downside risk look like? What should that be? Make sure you’re careful and have a withdrawal strategy that considers sequence of returns risk. While many retirees face the challenge of lower than desired income, luckily there are several ways that could potentially increase your income that should be considered. You can find your estimated Social Security benefit online by creating an account and viewing your benefits statement and earnings history. 1 Persons born January 1st of any year should refer to the previous year. 2 All percentages are approximate due to rounding. You can also claim Social Security on an ex-spouse if you were married for at least 10 years or if you are a survivor that was married to your spouse for typically at least nine months at the time of their death. The maximum spousal benefit you can receive, if you file at full retirement age, is 50% of your spouse’s benefit. 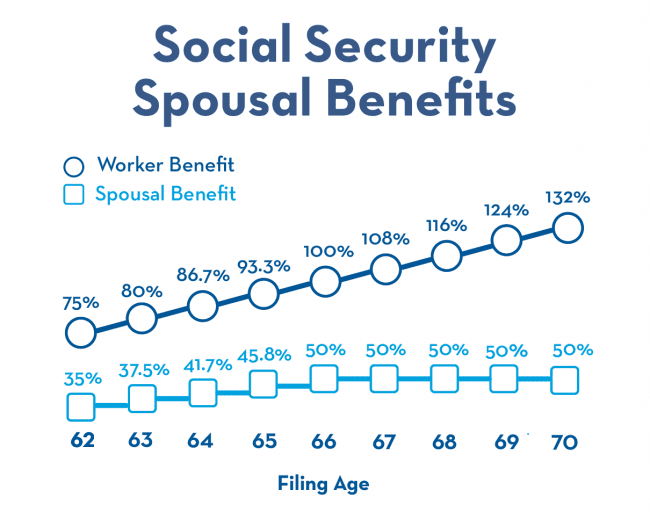 If you claim the spousal benefit at age 62, it would be only 35% of your spouse’s benefit instead of 50%. So, assuming that your spouse’s benefit is $2,000, instead of receiving a $1,000 spousal benefit, it would be reduced to $700 if you claimed it at age 62. 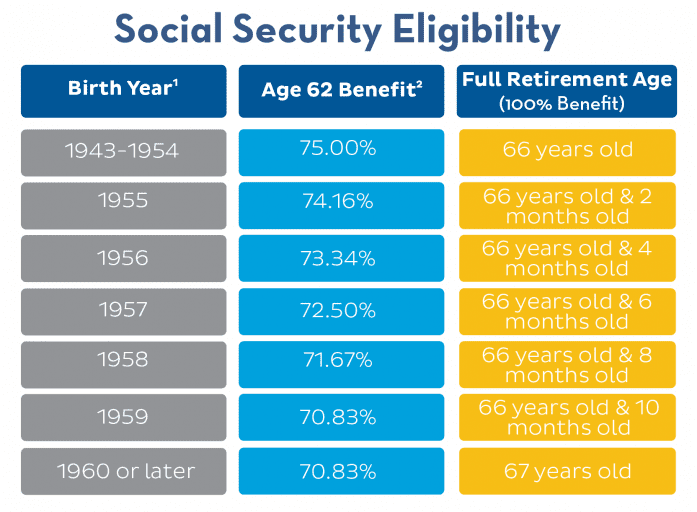 Please note that there are exceptions to claiming these benefits, if you have questions on if you qualify, please visit the Social Security Administration website. Recipients can also elect to receive benefits as early at 62 for a reduced amount. Those who do elect to take income early could be potentially subject to the “retirement earnings penalty” if they continue to work and earn above a threshold. Those who wish to boost their retirement income will likely forego this option and wait until at least full retirement age or potentially even defer until age 70. Assumes full retirement age of 66. The percentages for the spousal benefit are based on the primary worker’s benefit (benefit at full retirement age). Those who defer receipt of benefits until age 70 could potentially increase their benefit by as much as 32% if their full retirement age is 66, or slightly less for those with later full retirement age. This can be a substantial increase over time since all future cost of living adjustments will be based not on the base amount, but the increased delayed amount received. Given these advantages, some investors who retire before 70 may still wish to defer their receipt of Social Security until this point, opting to withdraw their income from other sources instead. The strategy that you have to figure out is at what age do you want to claim your benefits? When you look at life expectancies in the 1980’s people died earlier, around 78 or 80. Now people are living a lot longer. However, people are still claiming their social security at the same age. So, if we’re living longer, it might make sense for you to delay your Social Security as much as possible. This hypothetical example is used for illustrative purposes only. Actual benefits and results will vary. 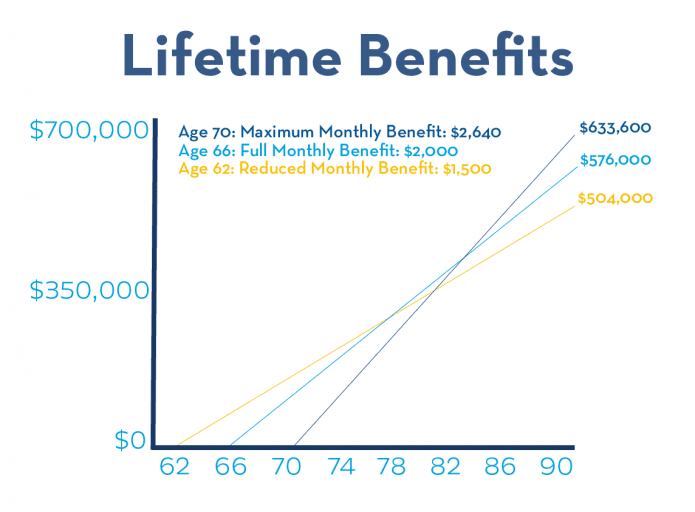 Once you reach 70 years old, your monthly benefit will stop increasing at 132%, even if you continue to delay taking your benefits. Important note: sometimes medical insurance could cost more if you delay applying for it. Make sure you take that into consideration when you’re weighing your options of delaying your social security benefits. 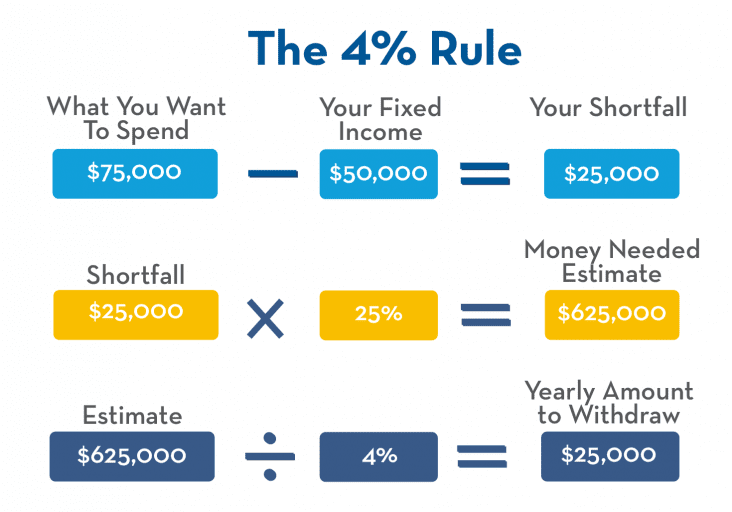 What is the 4% Rule? The 4% Rule is something used to calculate how much money you could safely withdraw from your retirement account yearly. This could be used to help push out your retirement a little bit more, making it easier to increase your overall social security benefit. Let’s say you want to spend $75,000 in retirement and you have social security income of about $30,000 and $20,000 of additional income, totaling $50,000. If you want to spend $75,000, you need $25,000 from somewhere else. So, you take that $25,000 that you need and divide it by that 4% (or just multiply that by 25) giving you $625,000. The $625,000 is approximately what you need to have saved to be able to generate that kind of cash flow and keep your withdrawals within the 4% target. 4% of $625,000 is $25,000. So, what can you do? You need to figure out exactly what you’re spending on a monthly basis and multiply that by 12. What do you think you can expect from Social Security? What do you think that you will get from a pension? It would help if you asked yourself what other incomes you will have and budget correctly. Your spending need minus your fixed income gives you your shortfall, and then you multiply that by 25, and that will give you an estimate of how much money you’ll need. Note: This is not an exact science and is just a rough estimate of what you need to save. There are many factors involved here. However, we recommend you do this to see where you’re roughly at. We believe that the 4% Rule is an excellent gauge to ask yourself if you’re on track and to know where you need to be while also looking at where you’re at. Once you retire, things will continue to change and impact your actual withdrawal needs. Market returns will have an impact of the safe amount to withdraw each year as well. Before we tell you why you should consider equities in retirement, let’s start with what they are. An equity is the ownership of an asset, business, or property after all debts, liabilities have been met. There are different types of equity you can look at. For example, there are stockholders’ equity, home equity, and private equity. When you begin planning for retirement it is usually advised to avoid too much portfolio risk. Most investors will wish to decrease their exposure to equities as they approach and enter retirement by building a portfolio that can provide a good chance to meet your goals without too much equity risk. However, having equities into your retirement is beneficial for portfolio growth. For an investor whose primary goal is growth, you might choose an all-equity portfolio. The desired returns could be achieved through less risk with a broader asset allocation. You should have some sort of equity in your overall portfolio. And when the markets take a dip, instead of panicking, you could buy more and try to rebalance your overall account. It would be beneficial to keep a portion of your funds invested in equities throughout retirement. A big part of this can be attributed to the fact that people are living longer. When you retire, you’ll have a bigger need to produce income and will need to keep up with price increases for goods and services. Those who have earned retirement benefits often have the choice of receiving a lump sum or a lifetime payment, potentially covering their spouse as well. Financial professionals are commonly asked which of these options should be taken. 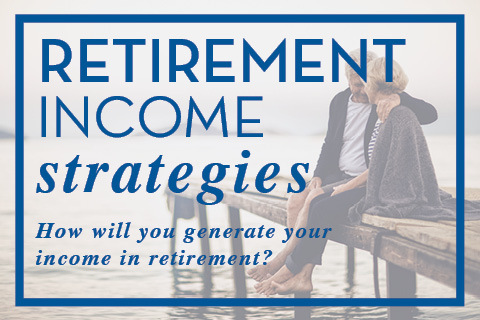 There is no clear answer until one can compare the amount of the lifetime payment to what amount of income could be produced by utilizing other strategies outside of their retirement account. If you’d like an income option, be sure to compare the opportunity at your current organization with the options available by taking the lump sum and using it to produce income outside of a pension. Those approaching or even in retirement should consider the tax implications of their income sources to potentially ensure they receive the maximum amount of income possible after taxes. Investors should consider tax diversification just as they consider diversity in their asset classes. There are different “pools” of money available to investors, such as tax-free, tax-deferred and taxable money. This might mean a Roth IRA, Traditional IRA, and regular taxable account in the individual investors name. Each pool has unique features that the investor should be aware of, not only in isolation but in how they may potentially affect other aspects of their financial situation in retirement such as the taxation of Social Security, or the premiums they pay for Medicare Parts B and D.
Depending on your situation, it may be advantageous in a given year to convert deferred accounts to Roth status or realize gains or losses in a taxable account. If you’re looking at generating income in your portfolio, there’s something called a total return approach that can help you meet your goals. It is a very good way to look at creating income or building an overall portfolio. The total return approach is where you choose how to get that cash flow from your portfolio. It might be from dividends and interest income, or it could be from selling some of your assets, such as stocks and bonds. 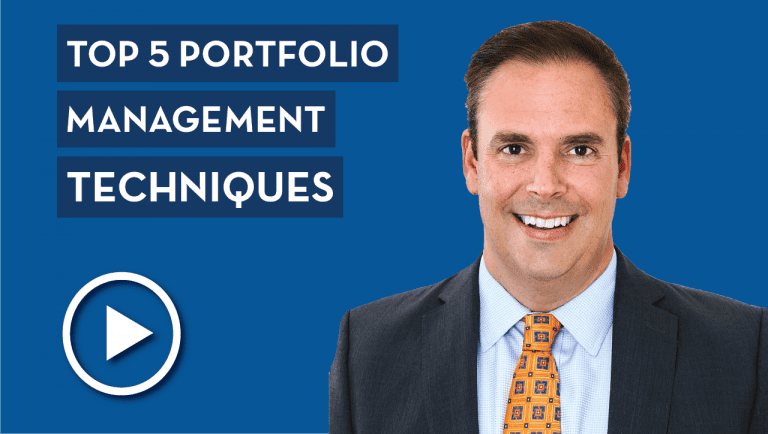 By adding assets to your portfolio, you can reduce the risk and increase the return. For many people, this approach is a more reasonable and less risky one to follow. If you take dividends and interest, every penny of that is taxable and if you’re selling part of your assets, there are some potential tax advantages that could reduce your portfolio’s tax liability. Working longer may not be your first choice, but it does a few things for boosting your overall retirement income. It will help you delay collecting your social security benefit, helping you get higher benefits while saving for a longer amount of time. When you’re working longer, you’re also not spending your nest egg. 70 should be the target date for retirement because as a society we’re living so much longer thanks to the advancements of health care and everything else. So, because we’re aiming for a later retirement date, we should be working longer to help build our nest egg more. I’d take this out. I don’t think we’re telling anyone that the target retirement date for people is 70. Now you may not want to work full time, but how about considering getting a side job or part-time work? Doing this is easier than ever, whether you’re dog sitting, or consulting, or maybe even tutoring, there are many ways to gain a little bit of extra income. It might be just enough to get over the hump so you can continue your lifestyle and get that little boost in retirement income you need. This isn’t necessarily going to work for everybody because the maximum reverse mortgage for most people is probably in the $300,000 range. You have to be able to pay off your existing mortgage and need to be over 62 years old, as well as, be a homeowner. However, if you qualify for this, you may be able to get rid of your mortgage payments as well as generate some cash flow. If you’re receiving payments instead of paying a mortgage, that can make a pretty big difference. Do you have an extra room in your home? If so, rent it out. Every little dollar helps, and this is a great way to generate some additional income. There are all sorts of different things that you can potentially do to secure your overall retirement. Many factors can potentially impact your income during retirement, making it a challenging topic for many new retirees because they may be used to having one source of income during their working life, such as wages. When retirement finally arrives, it can be difficult to understand how all the pieces of the puzzle work together. Instead of wages from a single job, maybe you have Social Security, a small amount of part-time income, withdrawals from various accounts, including Roth and Traditional IRAs, and potentially other income sources as well. Let’s look at some of the things that can potentially reduce your retirement income and how to plan to minimize the impact these issues can have. By far one of the biggest challenges facing retirement savers is how to arrange their savings among various account types for efficient withdrawal of income during retirement. Unfortunately, many have all their funds in tax-deferred account types, such as traditional IRAs and 401k accounts. This means that you got a deduction, which reduced your taxable income for the contribution that was made during your working life, but now in retirement you will be taxed on the full balance when withdrawn, including your own contribution plus any growth. Often the other “pools” of money, such as taxable or tax-free accounts, aren’t included in the plan of many retirees, leaving little room for flexibility in withdrawal choices during retirement. Savers with time left before and even those in retirement should discuss tax diversification with their financial planner. We all know we should diversify our investments, but many haven’t planned on tax diversification. It may be advantageous for many to consider strategies to achieve tax diversification. This could include converting a portion of the balances currently held in tax-deferred accounts to Roth status. Many retirees opt to take their Social Security benefits early at age 62 rather than their full retirement age. In addition to a reduction in benefits as high as 25% (depending on the full retirement age of the beneficiary), many also are subject to the Retirement Earnings Penalty if they are still working while taking benefits early. If earnings exceed a certain threshold ($17,040 in 2018), the reduction is as much as $1 from your Social Security Benefits for every $2 earned. There are additional provisions for those who retire mid-year and for those who reach full retirement age after being subject to this provision. Amounts that are reduced will potentially increase your Social Security benefit later, so you may not actually “lose” the funds, although those who are married should understand that the widows benefit of any survivor who is claiming on their earnings record will be based on the early receipt of benefits without adjustment for the retirement earnings penalty. Social Security has two provisions that can potentially affect the benefits of those with “non-covered” pensions, which are pensions held by certain state and federal employees who were not required to pay into the Social Security system during their employment with their agency. These provisions are the Windfall Elimination Provision and the Government Pension Offset, often referred to as WEP and GPO. A retiree may be subject to WEP when they have a non-covered pension but receive a social security benefit of their own based on the earnings record they have from other employment. 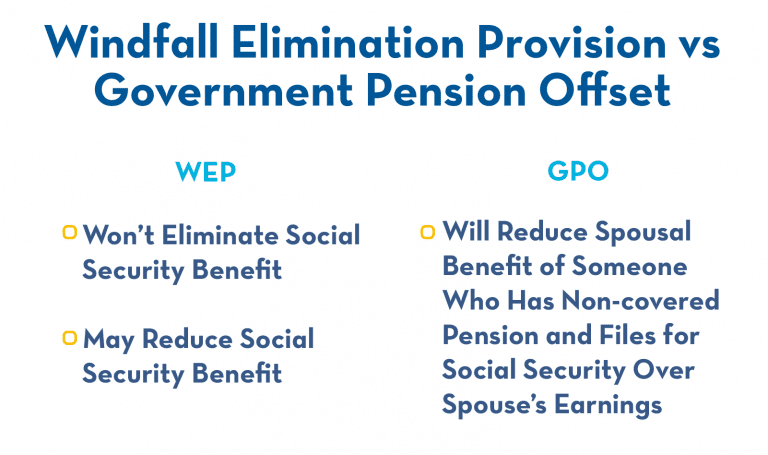 WEP may reduce but will not eliminate a Social Security benefit. GPO will reduce or potentially eliminate the spousal benefit of someone who has a non-covered pension and files for Social Security based on a spouse’s earnings record. It can be challenging to determine if and by how much you may be affected by either provision. If you have a non-covered pension, even if you plan to opt for a lump sum version instead, you should familiarize yourself with the publications the Social Security Administration has made for each. Both WEP and GPO have their own two-page PDF publications that describe the nature of the program as well as the variety of exceptions that you may be eligible for based on start date, “substantial earnings” or other reasons. Those who may potentially be affected may also use the WEP and GPO calculators. They should not assume that their benefit earnings estimate available online reflects any reduction for WEP or GPO. Retirees will see their primary insurance amount without reduction. The Social Security Administration will become aware of the appropriate reduction amount when applicants file for their benefits and answer several questions, some of which relate to pension benefits. There are certain taxes and fees that occur during retirement that can be affected by your income from other sources. These include: the taxation of capital gains and dividends, the taxation of Social Security benefits, and the amount of premiums for Medicare parts B and D. It’s important to understand not just how the income sources you have work as investments or how they are taxed, but if they affect other aspects of your plan and how they may potentially cause you to incur costs in other areas. As you can see, many of these issues can be complicated and potentially confusing to navigate individually and in conjunction with one another. If you would like assistance in planning for your own retirement income needs, consider an assessment with a CERTIFIED FINANCIAL PLANNER™ professional at Pure Financial Advisors today. CAN YOUR RETIREMENT INCOME BE GARNISHED? Garnishment occurs when a court issues an order for a third party, such as a financial institution or employer, to not deliver funds to the account owner or employee, but rather to withhold those funds until such a point has been determined how a creditor, who is owed the money, is to be paid. Those who hold the funds, such as a financial institution or employer, for example, may be liable for amounts that they make accessible to the debtor in error after receiving a court order. Can Retirement Income be Affected? The short answer to this question is yes. However, there may be limitations on what can lead to garnishment, and various sources of retirement income are treated differently. Social Security, for example, can be garnished for a variety of debts, including but not limited to, federal income tax, alimony, child support, victim restitution, and other debts to the federal government. Supplemental Security Income, however, is not subject to garnishment. 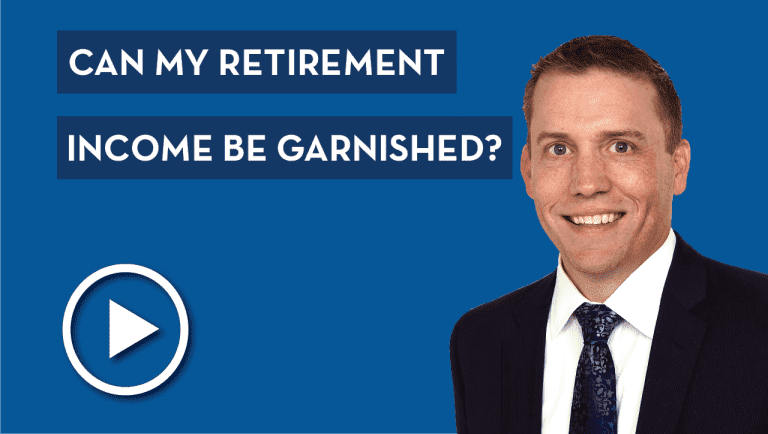 401k accounts and other Employee Retirement Income Security Act of 1974 (ERISA) covered plans are protected from garnishment by private companies, credit card companies, or banks, but may sometimes be garnished by the federal government. IRA accounts are not subject to the same ERISA protections afforded group plans such as 401ks; this means that they may be subject to additional garnishments beyond those able to affect 401ks. It should also be understood that although some types of garnishment of IRAs may be avoided when filing bankruptcy, legislation has been passed limiting this amount to a million dollars. Some states may provide additional protections against garnishment beyond those available at the federal level. Be sure you understand how this works in your state since there is quite a bit of variation from full protection for non-federal garnishment to protections only for funds that have been in the account for a certain period. If under the age of 59.5, you will usually receive an early redemption penalty of 10% to withdraw funds from your IRA, if you do not have an exception. Note that while a garnishment to satisfy an IRS debt will count as a valid exemption, amounts used to service other garnishments will not. How Much Will Be Garnished? Other sources of retirement income may be treated differently than wages, so it is advantageous to discuss your specific retirement income source with an attorney. There are steps you should take if you anticipate your income will be garnished or if this has already occurred. First, do not attempt to resolve the garnishment with the employer or financial institution that has received the court order. They are legally responsible for withholding the funds and as mentioned above will be liable for any funds they incorrectly make accessible to you. Those who have not yet been garnished should negotiate with their creditor including responding to any demand letters that have been received. They may also challenge the underlying judgment that may lead to the garnishment or object to the garnishment itself. In many cases, filing for bankruptcy will prevent garnishment, although this is a process many prefer to avoid if possible. There may be specific laws in your state that relate to garnishment, and you should discuss those with a qualified attorney familiar with the process. Be sure also to keep all your financial professionals informed since the garnishment may affect your tax and retirement planning objectives as well. If you’ve yet to establish a relationship with a financial planner, consider doing so to discuss all of your financial goals going forward. WHICH STATES TAX RETIREMENT INCOME? Do you remember the first job you ever had? Perhaps you worked in retail, fast food or another part-time role while in high school. Before receiving your first check, you had probably calculated and mentally spent the amount. Then you had the same experience that everyone did when they looked at a pay stub for the first time. What happened to the check? What are all these different taxes? When you retire, you might be in a comparable situation, except you don’t get surprised two weeks later; instead, it happens upon filing your first tax return after retirement. You may have multiple sources of income such as a pension, social security, stock dividends or other sources. This can be confusing for many new retirees or those approaching retirement. The federal taxes can be difficult to understand, but your retirement income may also be affected by the state you reside in as well. This can be a prominent issue to consider beforehand if selecting a retirement destination from multiple options in the states. Let’s look at which states tax retirement income. There are currently seven states that do not have a personal income tax. They are Wyoming, Washington, Texas, South Dakota, Florida, Nevada, and Alaska. This means that in addition to not being taxed on any employment income, you would also not be taxed at the state level on amounts withdrawn from your tax-deferred retirement accounts including your traditional IRAs, 401ks, and others. Roth accounts will still have the same tax-free treatment they have at the state level, and investment income such as dividends and capital gains will avoid taxation. This brings us to two states that warrant unique consideration. Although residents of New Hampshire and Tennessee are not taxed on their ordinary income from sources such as wages or pensions, those with certain types of income may be taxed. New Hampshire imposes up to 5% in tax on dividends and interest while Tennessee similarly imposes up to 6% on those items for tax years ending on or before December 31, 2015. The tax rate in Tennessee has gone down a percentage each year since and has been fully repealed for any tax year beginning on or after January 1, 2021. Tennessee residents refer to this tax as the “Hall Tax,” after the Senator who sponsored the legislation. Those who plan to reside in either of these states may wish to examine the income generating investments they hold in taxable non-retirement accounts to determine if they are still the best fit considering these taxes. Which States Tax Social Security and/or Pensions? Retirees who expect Social Security to represent a sizable portion of their retirement income have a lower likelihood that their state will tax Social Security benefits. 37 states and the District of Columbia do not tax Social Security benefits. The states that do are Colorado, Connecticut, Kansas, Minnesota, Missouri, Montana, Nebraska, New Mexico, North Dakota, Rhode Island, Utah, Vermont, and West Virginia. Those who reside in one of these states should carefully examine the specific circumstances under which those benefits are taxed. Just like at the federal level, it can be complicated and can depend on the types and amounts of income earned from sources other than Social Security. Those receiving pension income may get a break in 12 states. All seven states with no state income tax fall into this category, plus New Hampshire and Tennessee which only tax interest in dividends. The full list of 12 states are Alaska, Florida, Illinois, Mississippi, Nevada, New Hampshire, Pennsylvania, South Dakota, Tennessee, Texas, Washington, and Wyoming. 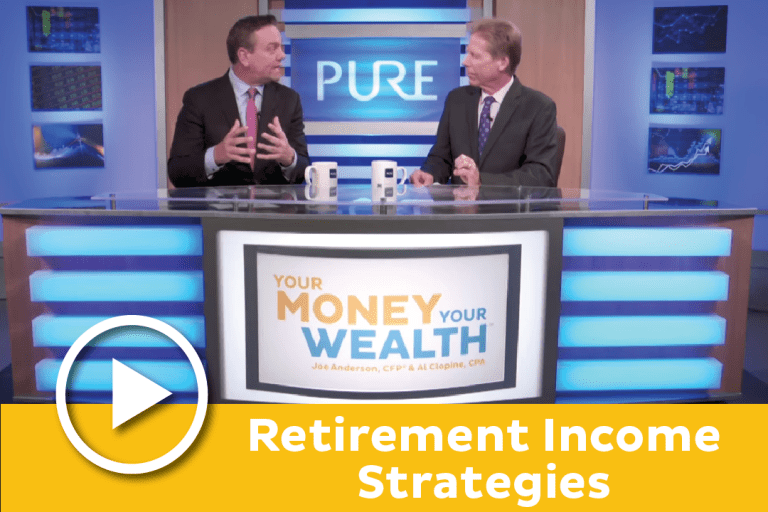 Creating an income strategy can be challenging even for experienced investors. Not only do you need to decide what is a reasonable and sustainable amount to withdraw, but also choose appropriate investments, rebalance them over time, and consider the tax impact on these decisions. While some investors are comfortable making these decisions and implementing their strategies on their own, many prefer to work with a professional. Consider meeting a CERTIFIED FINANCIAL PLANNER™ professional at Pure Financial Advisors. Contact us today to begin the assessment process and discuss your objectives for income during retirement as well as other aspects of your financial situation.